In my last post, I spoke about how I was into simplifying my wardrobe and sticking more to basics and neutrals. This outfit is also a reflection of that. It also showcases how just an addition of one stick out piece to neutrals can really have an impact, making a neutral outfit less "boring." 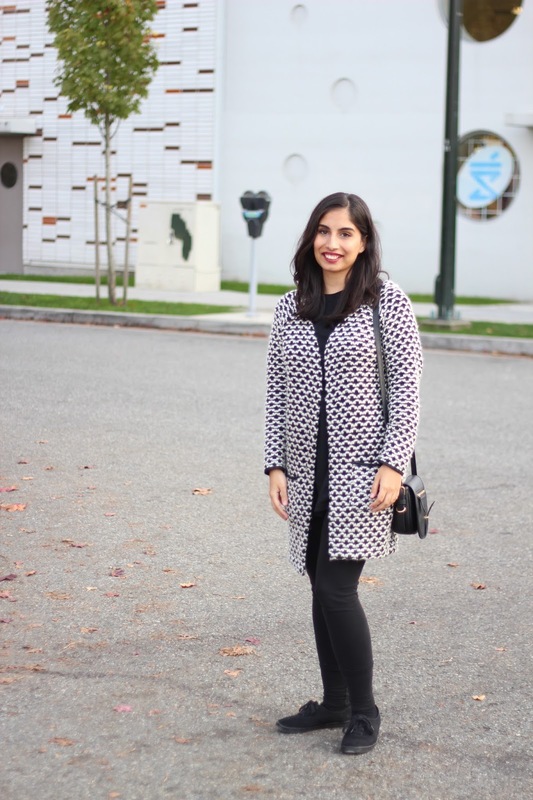 This black and white knit cardigan (okay truth be told, it's prabh's and I was borrowing it!) has such a beautiful pattern. I love what it does to make this outfit and the length is perfect as well. Adding to this simple outfits idea is also the idea of comfort. The key to my outfits has always been about comfort and thats why you'll often find me pairing sneakers with a lot of my looks. I can't tell you if this is a just a phase in my life, or if its just me getting older, but I'm quite liking it! Back to the black & white knit cardigan. It really has become one of those prized possessions or special pieces in prabh's wardrobe - and mine - since I borrow it all the time. It is from a local family owned store called Spank. It was one of those buys that happened when Prabh and I were window shopping in the South Granville area of Vancouver and wandered into this store because the window display was calling out to us! We walked away with quite a few nice pieces from this place and have returned a few times since. It's great to buy local and support local businesses. This place, in particular, focuses on Canadian and local brands and in a way it feels good to be part of a community and support one another! 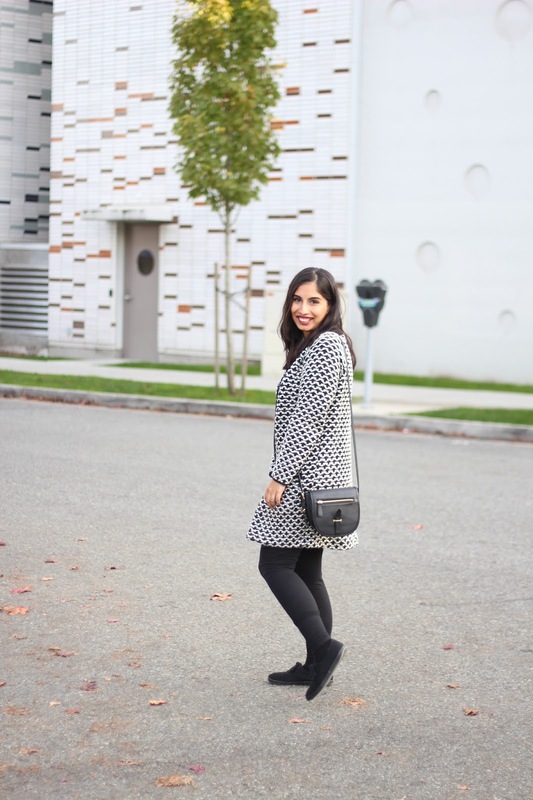 I LOVE that sweater..and everytime I come to your blog, it makes me miss my home!! Lovely post! It is my first time in your blog! LOVED IT! 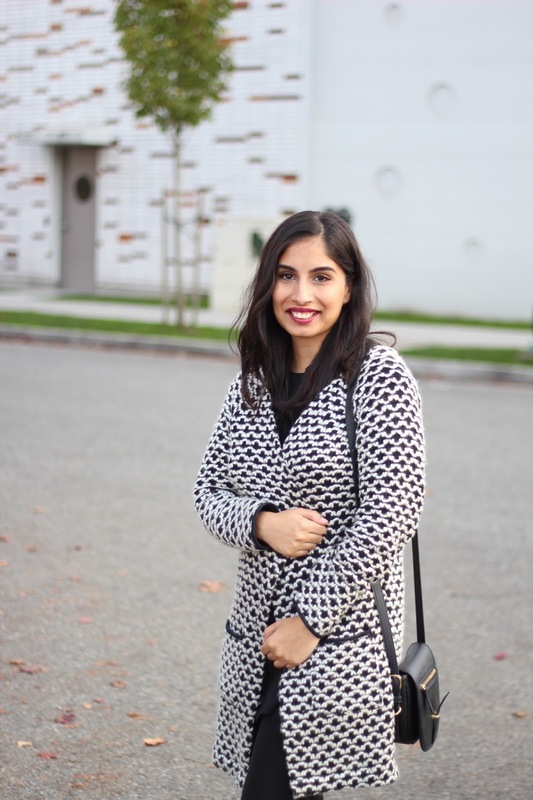 Very cute, I like the simplicity of the black and white, but the pattern of cardigan keeps it interesting. And that lip color is lovely on you. Love this cozy sweater on you! I can see it being worn with so many outfits. This is such a cute sweater! It looks very comfortable and relaxed! This is such a lovely outfit! Keep up the amazing style! very interesting, this piece looks like a classic treasure . Very cute! I love the style of your bag. I, too, want to simplify my wardrobe. I have so many things hanging that I neverrr use! Now will be a good time for me to cleanup :) right before the new year! Thank you for sharing! I have been working on simplifying my wardrobe as well. You are right, this coat this perfect! This is SO SO adorable! You are too cute! I love this outfit!!! I really want to simplify my wardrobe but add more bright colors! Gorgeous cardigan, very cute outfit. What other items do you want to add into your wardrobe?